[T]he use of the term fascist comes from the pen of a ranking social-democrat who was involved in the same political circles as Rick Hertzberg. I am referring to the late Bertram Gross, the man who wrote the Humphrey-Hawkins Full Employment Act of 1978, a key social-democratic piece of legislation actively supported by Michael Harrington, as well as major New Deal pieces of legislation from 1941 to 1945, including the Roosevelt Full Employment Act. He also created the President’s Council of Economic Advisers under Truman, for which he served as its Executive Secretary. Despite all his service to Presidents from FDR to LBJ, in 1980 Gross wrote a widely discussed book, called—–Friendly Fascism, the term he used to describe what he thought the United States had become, as he saw it moving away from his beloved social democracy to something else. America, he wrote, was moving to a greater concentration of power and wealth in a new Big Business-Big Government partnership, a new form of corporatist fascism. Gross called America a friendly form of fascism particularly to distinguish it from the classic evil fascist states he opposed, as well as the reactionary proto-fascist regimes the US supported in the Third World. In his eyes, the future America was fascist, and nothing was taking place that could prevent its development. He notes that America’s fascism would consist of an alliance of big business with government, to produce a new corporate authoritarianism that Gross thought subverted constitutional democracy. In failing to note my main point-that we need a thoughtful analysis of the direction in which Obama is taking our nation, and diverting it to an a historical one about “fascism”- Hertzberg shortchanges his readers. He certainly has a right to defend and promote and support Obama and to believe all Americans should unite behind him; I would be surprised if he changed his position- but he should think carefully before making the charge that those who feel otherwise have lost their marbles. So who’s right and who’s wrong? I think Ron’s marbles are quite safe, but I have to quibble with his argument in one respect. I’m all for thoughtful and critical analysis of the direction in which Obama is taking us. I just think that the use of the word “fascism” is not conducive to such an analysis; indeed, it tends to short-circuit rational debate because of the emotional reaction it evokes on both sides. On an emotional level, there is no disctinction between evil and non-evil fascism, since non-evil fascism is an oxymoron. Like, say, “concentration camp,” it is a word that cannot be separated from its historical associations. So my suggestion would be to leave “fascism,” friendly or not, out of the discussion. I still think Michael Ledeen is correct about the validity of the relevance of the economic component of the corporate state to today’s world. But perhaps this is a losing battle. Jonah Goldberg was savaged despite the many valid insights in his book for calling his study Liberal Fascism. He has valiantly defended himself. But to his critics, it is not satisfactory. The associations of the word fascism with concentration camps, the SS and the like is just too well established to not elicit the kind of negative reaction anyone who uses it gets. 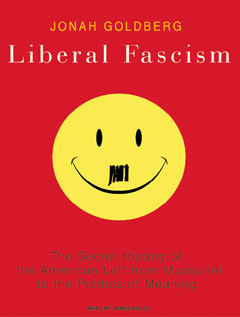 The smiley face with the little mustache is meant to invoke not even Mussolini, but Hitler. With this title and this cover, did Jonah really expect thoughtful debate? I agree with you that the term ‘fascism’ is so loaded as to make its use (as the lawyers would say) ‘prejudicial’. However, I would also add two major additional points that Bertram Gross did not seem to understand about fascism (at least if Ron Radosh’s analysis of Gross’ beliefs are accurate). 1.The main thing regarding fascism (or, at least totalitarianism), as George Orwell completely understood in 1984, is that it obliterated the line between the individual and government. It was far more than a close connection between government and business (which is more accurately identified as corporatism or crony capitalism), but it involved private citizens essentially living for the state (or even more commonly, for the leader). As in 1984, all of ‘civil society’ was for the benefit of the government. In their private time people were expected to work in civic groups that would do stuff to glorify the state. The ex wife of Winston’s coworkers “we need to have children as part of our duty to Big Brother.” (not an exact quote) Obviously that was fictionalized, but it was clearly where Hitler was moving. This doesn’t have to require high tech means either, The Ch’In Empire (also known as Qin Empire) in China (221-205 B.C) banded farmers together in groups of 20 where they were all ordered to spy on each other. The way to get them to follow this was that if one farmer was found guilty of something without it being reported by the others, all the other 19 would also be found guilty. The saying of the Qin Emperor was “the purpose of a soldier is to be a farmer, the purpose of a farmer is to be a soldier.” (not necessarily an exact quote, translations differ) So, a similar idea: all life was devoted to the state. It should also be noted that the Empire lasting only 15 or so years was not really a failure of totalitarianism. The Emperor died leaving a dope of a son to take over and the court fell apart due to infighting. The Emperor actually accomplished an incredible amount in 15 years, including the first unification of most of what is known today as modern China. This is not to say, of course, that I approve of his totalitarian actions (I don’t! ), but it does explain why apparently many Chinese today regard him with mixed sentiments. 2.That said, I don’t see much evidence that Obama is even a corporatist or crony capitalist, to use the term that Ron Radosh is actually referring to when he accuses Obama of ‘friendly fascism’. Raising taxes on corporations and the wealthy and bringing in a carbon cap and trade system is hardly evidence of a government friendly to business. There are of course distinctions between totalitarianism and fascism and the prevalance of corporatism is probably one of them. Most political scientists and historians would probably say that fascism is too incoherent and contradictory a ‘philosophy’ to actually distill the practical distinctions between fascism and totalitarianism. Suffice it to say that one does not have to be a fascist to be a totalitarian, but one does have to be a totalitarian to be a fascist. In so far as the use of the word fascist is so-loaded in the term ‘friendly fascist’, it would probably be best to assume that even a ‘friendly fascist’ is a totalitarian, and I certainly don’t think Obama is a totalitarian.